Many discussions have been made either by the hunt test community or general waterdog owners as to the differences between the current American field bred Labrador and the British field bred Labrador. We at Prairie Plains have had the great opportunity to train and work with both “breeds”. However, the misinterpretation should not be made that these two dogs are different in species, yet it is quite clear in comparison that only one of these two dogs represents what a “true Labrador Retriever” should be in the field and at home. We came upon the British lab by happenstance nearly 10 years ago and have been enamored by their abilities in the field and gentleness in the home. Because these dogs possess such incredible, inherent traits is why we became breeders. We wanted to take puppies with European field trial titles and show the hunt test community that these dogs can also perform at top levels in American hunt test. We are hunt test minded people who hunt our dogs every season. Our British Labs have such tenacity and endurance in the field that a downed bird very rarely escapes their retrieve. Below, we will attempt to define the inherent traits of the British Labrador and distinguish the differences found when in comparison with the current standard of breeding of American field bred Labradors. But first we must examine the reasons why these two dogs seem worlds apart. All Labrador Retrievers are one in the same. Meaning that the original strain of dog was first established in the 19 century by the Duke of Buccleuch in England. The first recorded Labrador Retrievers were imported to the United States in the early 1900s. Here is where the two “breeds” diverge in physical appearance and behavior. Most of the differences in the two dogs can be summed up in one word, culture. The culture of the United States and Great Britain are vastly different. The Great Britain culture is based on tradition. Therefore, their field trials represent a history and culture based on tradition. Great Britain dogs are also bred based along these lines of tradition and history. An examination into what comprises a British field trial gives yet another analysis as to why American dogs and British dogs seem so different. In British field trials, dogs are asked to sit quietly and patiently at the line while tens of birds are dropped sometimes within a paws reach. These dogs see mark after mark yet remain steady and calm. Dogs of this caliber of steadiness are not trained relentlessly to master this level of steadiness. They are bred for it. They are also bred for their hunting ability and use of their nose. British labs have incredible noses and hunting drive. Couple their hunting drive along with rock steady line manners and you have a complete retrieving package any handler can work. In comparison, American field trials require a dog to use it’s eyes and high energy drive to make retrieves at 300 yards plus. This aspect of American field trials has produced dogs that are quite high strung in nature and not easily handled by novice owners and handlers. Now for a continuation into the different idiosyncrasies between American labs and their British counterparts. Temperament: A major difference between the American field Labradors and the British labs is their temperament. The British lines produce dogs that are very intelligent, playful, and eager to please. They have tremendous naturally instinctive hunting ability with a keen sense of smell. Their demeanor is calm and relaxed with a drive to hunt and/or play hard. Their strong sense to please gives them a trait which allows the most inexperienced handler the ability to communicate a training program effectively. However, the inexperienced handler must also be warned. Some people will say that the British lab is too soft for the American way of training retrievers. This is definitely not so. We have trained our British labs and British labs of our clients with American methods and yes even the E-collar. The sensitivity of the British lab in our view is merely the dogs way of saying they may not understand a command or they are not ready yet to progress through more training. The British lab is so smart that they learn to not respond to a command out of fear of possibly of performing the command incorrectly. We look for these subtle ques of “sensitivity” and train on commands mastered to reinforce new commands. From our training perspective attrition to a command and training program is always the best route to master the command or drill. These dogs want to do one thing and one thing only, PLEASE. Use of attrition and more attrition will bring the dog through “sensitivity” phases in their training and provide an exceptional retriever when the dust clears. Weight and Conformation: A physical trait different between American labs and British labs is the size and conformation. The male British lab will typically weigh between 60-65 lbs. and the females between 55-60 lbs; whereas, American lab males can weigh nearly 100 lbs. and females might time the 70 lbs. scale. To anyone that hunts waterfowl from a boat knows how difficult it can be to pull a soaking wet dog with bird in mouth back into the boat after a retrieve. Dogs of great size also bring in huge amounts of water. A British lab will certainly make pulling them into the boat a little easier and not fill the boat up with water after a dozen retrieves. Here again the British tradition comes into play when looking at dog conformation. True field bred British labs are somewhat shorter in height and length than American labs. British labs have square block heads with adequate muzzle length to pick up large birds. Big muscular, broad chests and strong forearms with slim midsections and square hips with nice muscular hindquarters ending with a short, full fur beaver like tail. The way British dogs are put together gives them the ability to be highly athletic. These dogs can be the calmest, most steady dogs in the house and at the line, but when sent are like bullets shot from a gun. They are highly explosive when running on marks and blinds. 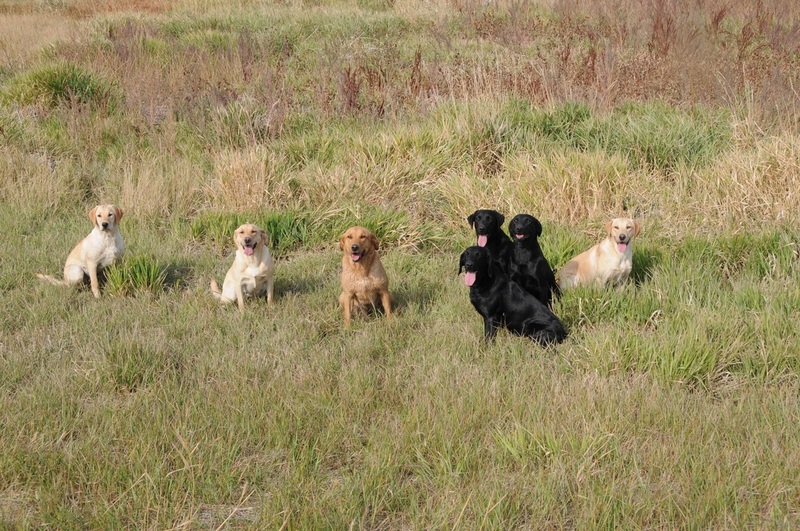 Prairie Plains offers British Labradors for sale as Puppies and Started Dogs. Our dogs come with full AKC registration. Our breeding dogs are titled in UKC Hunt tests, as well as, AKC hunt tests and have direct pedigrees of Sires and Dams with titles as Field Trial Champion and Field Trial Winner in European field trials.